AMARILLO, Texas -- A competitive eater has conquered three 72-ounce steak dinners in about 20 minutes during a food challenge held at a restaurant in Amarillo, Texas. 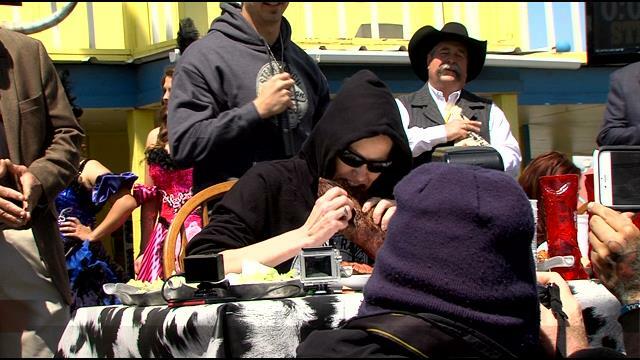 Dozens of people gathered outside The Big Texan Steak Ranch on Sunday afternoon to watch Molly Schuyler eat the steaks, plus three baked potatoes, three shrimp cocktails, three salads and three rolls. Schuyler finished her first steak dinner in 4 minutes and 18 seconds, which beats the restaurant's record of 4 minutes and 58 seconds, which she set last May. Each meal consists of a 72-ounce steak, a baked potato, side salad, shrimp cocktail and a roll, CBS News affiliate KFDA reported. During Sunday's challenge, Schuyler inhaled all three of the meals. That means she ate 216-ounces of steak (around 13 pounds total) and all of the sides. Schuyler was able to take down the feast in less than a half hour! She told the Amarillo Globe-News that she had to turn down a fourth steak, because she was sick of the taste and not because she was full. The 120-pound woman from Sacramento, CA, is no stranger to competitive eating. In May 2014, Schuyler beat the six year record previously held by Hot Dog Eating Champion Joey "Jaws" Chestnut, according to KFDA. She ate the entire 72-ounce steak and the sides in less than five minutes. Schuyler then went on to eat a second complete meal in less than 10 minutes. Schuyler, who's from Sacramento, California, ate 363 wings in 30 minutes at a Philadelphia competition in January 2014.